A dash of longer, lower and slacker, and an updated suspension system to increase progression make the new Range an enduro charging beast. Norco has unleashed a new Range, siblings in fact, whose carbon was redesigned from the ground up. 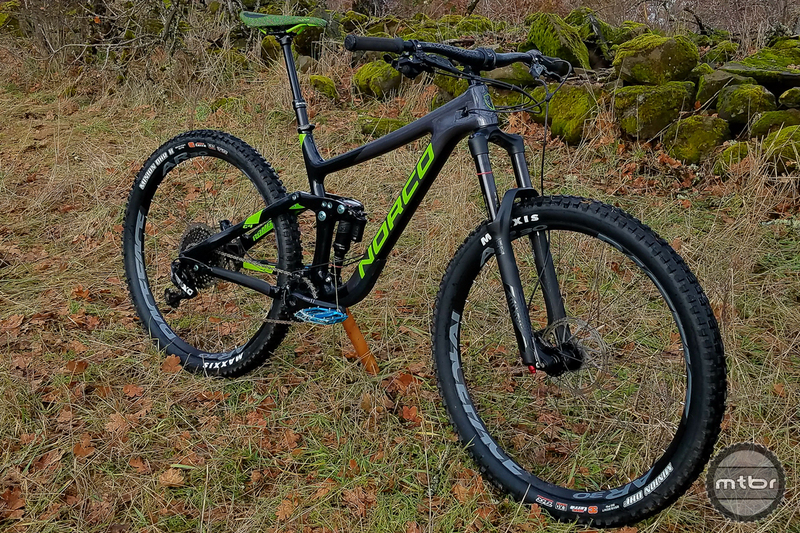 Norco engineers took the previous Range, added a dash of “longer, lower and slacker,” updated the suspension system to increase progression, and borrowed some elements from their Aurum DH bike. The end result is two different bikes, each with build kits tailored to the wheel size, and both with a focus on descending. Mtbr took early delivery of a 2017 Range C 9.2 tester. Read on to find out more about the bike and how our first ride went. Norco is offering three build tiers for each wheel size of the Range. 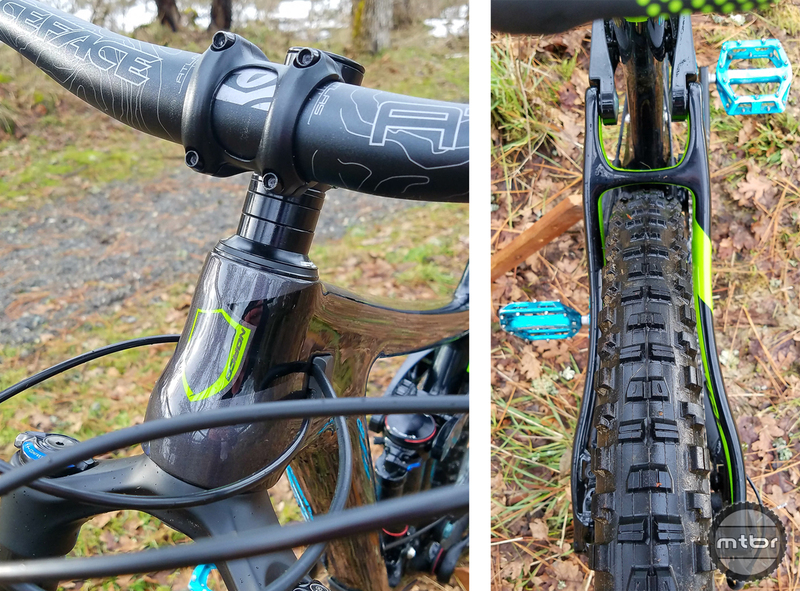 The C 9.1 and 7.1 builds include Fox suspension with carbon components, while RockShox suspension is used for C 9.2, 9.3 and C 7.2 and 7.3 builds. A frame-only option is available which includes Fox suspension and the top-tier colorway. Pricing is from $4249-$7399 for complete bikes, with our test bike ringing in at $5799. The frame-only option is $2899, including Fox Float X2 shock. 2017 Range C 29” build options. 2017 Range C 27.5 build options. Compared to the previous generation Range, Norco slackened the head tube by a half degree, added some reach, and lowered the bottom bracket height slightly. 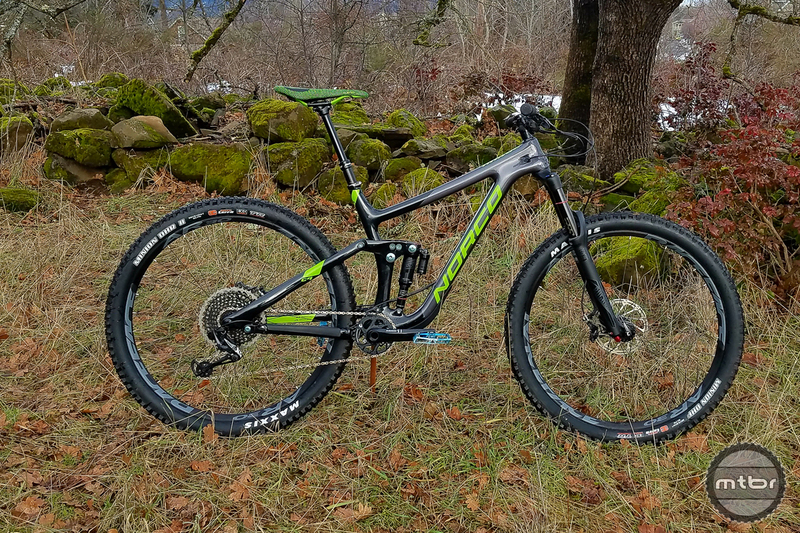 The 29er version uses the same chainstay length with a slightly steeper head tube, increased fork offset, and shorter stem to provide a similar wheel base and rider fit and feel. 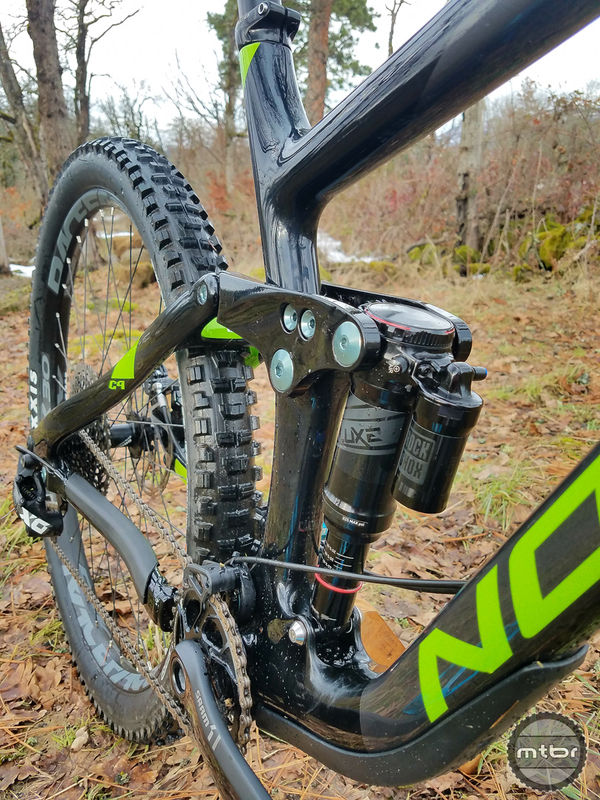 Norco engineers updated the rear suspension to increase progression, reducing harsh bottom out and improving pedaling performance. The shock is metric with trunnion mount, which passes the mounting bolt through the shock’s body to save space. Boost spacing is used front and rear. The head tube (and a whole bunch of spacers). Ample rear tire clearance, enough for a 2.4WT and maybe even a 2.6. The focus for this bike is durability, so it’s not the lightest out there. Indeed, it’s designed to withstand the abuse of racing enduro, which is essentially 4-5 downhill runs a day minus the chairlift assists. Norco took lessons learned from developing the Aurum DH bike and applied them to the Range to maximize strength. Brake line housing is nicely secured to the chainstay. The carbon frame uses internal routing on the frame, with removable port covers to ease access. Carbon seatstays are paired with alloy chainstays and linkage, a great combination for durability. Cable routing on the chainstays is external. With the C 9.2 build kit, the shock stanchion is oriented downward so the rear derailleur and brake lines run adjacent. Tension should be closely watched. SRAM’s Eagle 1×12 drivetrain adorns the C 9.2 and C 9.1 builds. Its range is quite impressive and I often found myself *not* in the granny gear on climbs, thankful to still have a bail-out gear even with a 32T front ring on a 29er. The Eagle derailleur jockey wheels are significant, reminding me of a pizza cutter. SRAM Eagle alloy cranks are on the C 9.2, passing through a SRAM pressfit BB92 bottom bracket. A One Up ISCG05 chainguide keeps the chain in place when things get bumpy. 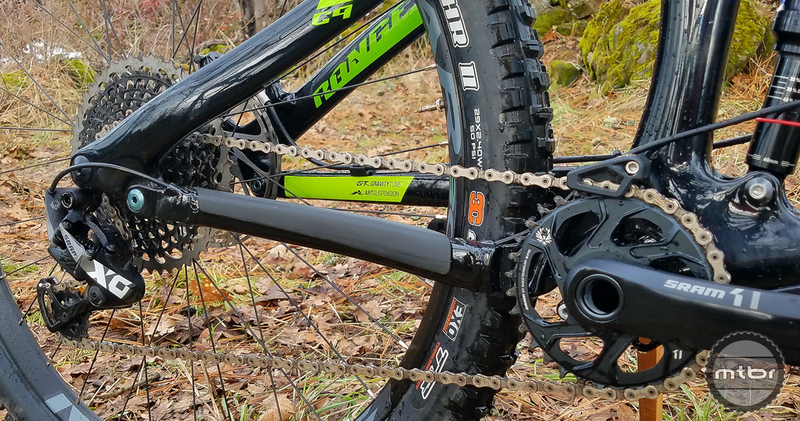 There is lots of gear range thanks to the Eagle drivetrain. Race Face was selected for the cockpit: Atlas 800mm bars, 40mm stem, Turbine 150mm dropper post, and an SDG Duster RL Saddle. SRAM Guide RS brakes handle deceleration duties, with 180mm rotors front and rear. Given the bike’s intended application, the front rotor seems a tad small. 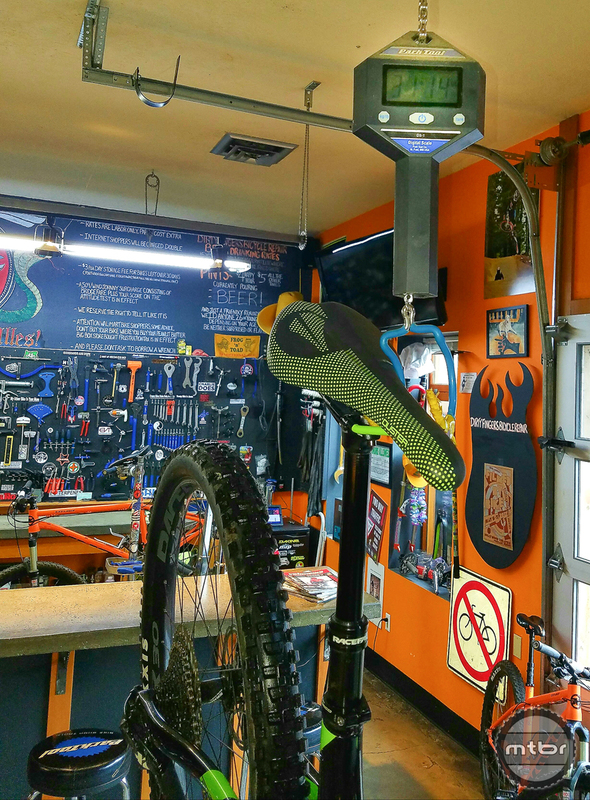 Norco selected RockShox to suspend and damp the ride on the C 9.2 build kit. A Super Deluxe RC3 shock handles the 150mm of travel, while a Lyrik RC 160mm fork is up front. RockShox Lyrik 160mm Fork (left). Updated linkage with RockShox Super Deluxe Metric shock on the C 9.2 (right). Race Face was again selected for wheels, using the AR 30 alloy hoops laced to SRAM hubs. Tires are Maxxis DHF 2.5 WT and DHR II 2.4 WT, both excellent choices. Add it all up and our tester Range C 9.2 in size large weighed in at 31.14 pounds sans pedals. 2017 Range C9.2 weighing in a 31.1 pounds without pedals. It’s early in the riding season, so I was a bit apprehensive about pedaling an enduro sled uphill. Thankfully, the Range has an upright pedaling position, reducing fatigue as the miles spin past. 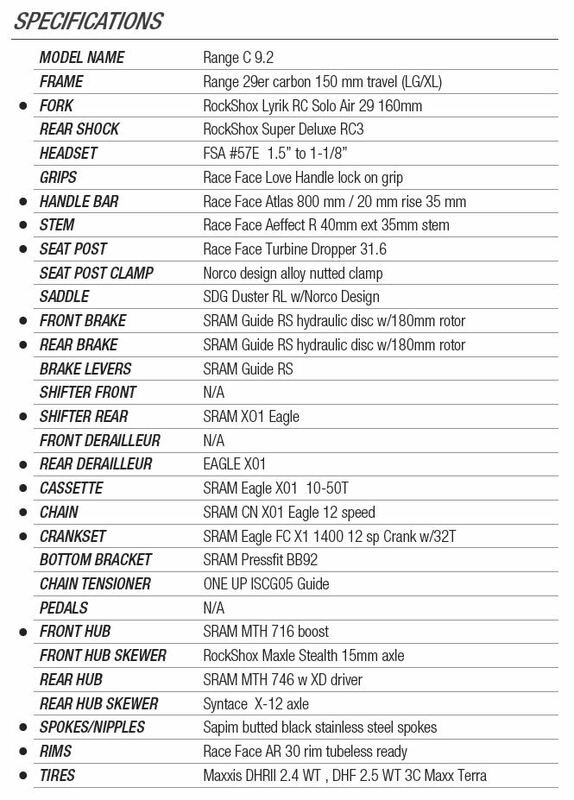 SRAM’s Eagle offers 12 cogs between 10 and 50, meaning even this gravity-challenged rider actually had a bail-out gear. Some pedal bob was observed when the shock was fully open, but I had to look to see it, eventually locking out the shock for smooth climbs and using the middle position for more technical ascents. When pedaling through rocky terrain, the suspension was supportive yet the rear wheel didn’t hang up on sharp edges. There were a couple of instances where I mistimed a pedal stroke, expecting a pedal strike, but the bike rides high enough that it did not occur. The Range is designed to descend while getting you to the top with minimal effort. After dropping the saddle, body position was centered on the bike, providing a neutral feel. 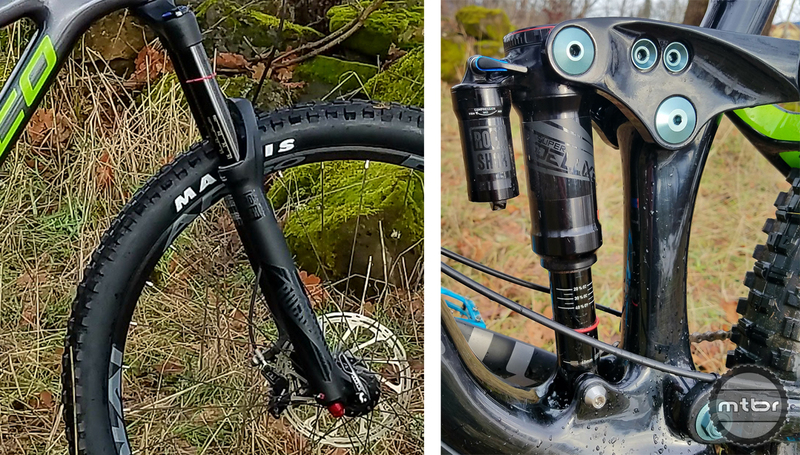 The more relaxed head tube angle further improves descending performance, letting the fork work while providing support should the rider’s weight get a tad too far forward. When carrying speed through rough terrain, the Range was nicely composed, letting the rider move the bike around. (I suspect steep terrain will really let this bike shine.) In bermed corners, I tended to feel like I was above the bike rather than within it, so we’ll see how that goes as we become more acquainted. That said, the front tire stuck to the ground through the turns without washing out. First ride on the new Norco Range 9.2. Our first ride test session went well. The Range pedaled uphill well, traversed rough terrain with composure, and made the descent a worry-free fun fest. We look forward to putting the Range through its paces over the coming months and will report back after unleashing it on some more legitimate downhill terrain. For more information visit www.norco.com. Cable routing near the shock stanchion – be careful to secure them.